The COMPREHENSIVE kit contains 58 quality items to deal with the usual run of cuts, abrasions, bites, stings and things that children run into, pick up of have inflicted on them. It includes a digital thermometer, hot/cold reusable pack, saline solution and creams. 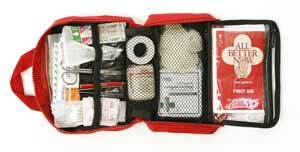 The STANDARD kit contains 47 quality items for basic first aid needs. They are both ideal gifts for new mothers and caregivers, however they are also perfect for the home, baby bag, car, boat or bach. Convenient - It eliminates the need to run out and buy supplies as it has all the necessary items for many different situations at your fingertips. Compact - Small enough to always be handy. Perfect for car, boat, bach and home. Portable - Easy to take to babysitters and grandparents who don't usually have paediatric supplies on hand. Easy to Use - The design of the bags allow for ease of use. The pockets and clear waterproof compartments allow you to see and find items quickly when they are needed. The first aid instruction booklet is readily available in an inside pocket. Expandable - Extra room is available to add additional supplies (i.e. prescription medications), giving you the convenience of having all health related supplies in one place. Economical - The All Better NowTM kits are more economical than purchasing supplies, medications, and instruments individually.